The choice of diSPIM objectives is limited because they must be co-focused without bumping into each other. The most commonly-used objectives for diSPIM are 40x water-dipping objectives with a NA of 0.8 (Nikon CFI Apo 40XW NIR). The Olympus 20x/0.5 objective is another possibility1) as is the Nikon 10x/0.3. ASI and Special Optics have co-developed an custom objective for cleared tissue that is suitable for the diSPIM and can image cleared tissue up to 5 mm deep in slab form or within a 12 mm spherical envelope. Single-sided systems (iSPIM) have much more flexibility because the illumination objective can be a low-NA long-WD objective. Most often sCMOS cameras are used for SPIM imaging. 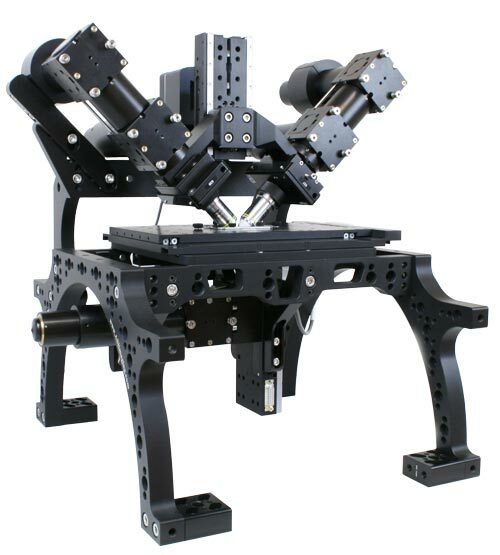 There are working diSPIM systems with Hamamatsu Flash4, Andor Zyla, and PCO Edge cameras, and support for Photometrics Prime 95B was added May 2017.